After being dropped by Capitol Records (following ska-punk's decline in popularity), Less Than Jake signed with Fat Wreck Chords, an avid supporter of pop-punk and ska-punk bands, and created one of their best albums to date, Borders & Boundaries. 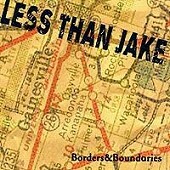 Borders & Boundaries is their most-produced, tightest album to date. The album takes full advantage of the production, too. Sugary guitars, near-perfect vocals, and a solid rhythm section drive the already infectious pop songs to a new high, while the blazing horn section further injects the songs with a controlled mayhem. If you thought the band lost its spark when it signed to Capitol Records, think again. Next to Pezcore, Borders & Boundaries is the best the band has offered us. Though more pop-punk than ska-punk, the thoughtful lyrics and attention to detail carry the album all the way to the finish line. I'll give it an A-.